Pedro Sauer was born and raised in Rio de Janeiro, Brazil, where from an early age, he began training in the martial arts. At age five, he began boxing and later took up judo and taekwondo. At age fifteen, however, his friend, Rickson Gracie, invited him to practice jiu-jitsu with his younger brother, Royler, who at the time was only nine years old. The outcome of this experience convinced him thatBrazilian Jiu-Jitsu was the most effective of all the martial arts, and he began official training the next day. Sauer worked towards a double major (Economics and Business Administration) in college, and took post-graduation course at Fundacao Getulio Vargas. He worked in Brazil as a stockbroker for eleven years before deciding to move to the United States and pursue a career teaching Brazilian jiu-jitsu. 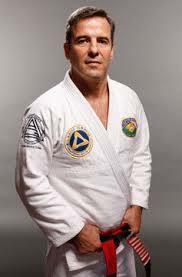 In 1990, he moved to California with the original wave of Brazilian Jiu-Jitsu instructors. He lived in California with Rickson Gracie and trained daily with the Gracie brothers (Rickson, Rorion, Relson, andRoyce), their father, Helio Gracie, their cousin, Renzo Gracie, and the Machado Brothers, as well as many others. In December of that same year, he moved to Utah, where he lived for sixteen years, pioneering Brazilian jiu-jitsu in the Southwestern United States. In the fall of 2006, Pedro Sauer and his family relocated to the Washington, D.C. Metropolitan Area where he currently teaches at the Pedro Sauer Total Self Defense Academy in Sterling, Virginia As well as at over eighty affiliate schools throughout the world. To date he has promoted around 40 people to the rank of black belt in Gracie jiu-jitsu which include UFC fighters Jeff Curran and Eric Schafer, as well as MMA coach Greg Nelson. On February 24, 2010, Sauer was promoted to an 8th degree red black belt by Relson Gracie. 1986 – Tecnico de Jiu-Jitsu. This is a special certificate given by Helio Gracie in recognition of superior technical mastery of the art of Brazilian jiu-jitsu. Pedro earned his Black Belt from Helio and Rickson in 1985, after years of training at the famous Gracie Humaitá Academy in Botafogo, Rio de Janeiro, Brazil. He then began his career as an instructor in 1986 when asked to teach with an organization known in Brazil as Corpo/Quatro (Body of Four) where he taught and continued his training under jiu-jitsu instructors Alvaro Barreto, who is a 9th degree (red belt) master under Helio Gracie. After moving to Utah in December 1990, he taught as one of only two non-Gracie black belts under the Gracie Jiu-Jitsu Academy (run by Rorion and Royce Gracie). In October 1996, he became an official representative Black Belt Instructor under the Rickson Gracie American Jiu-Jitsu Association. On May 17, 2005, he was named “Best of the Best Brazilian Jiu-Jitsu Instructor” in a worldwide internet poll conducted by the Abu Dhabi Combat Club (ADCC). He is the head of the Pedro Sauer Gracie Jiu-Jitsu Association.